Passe um dia explorando a Eslovênia durante esta excursão de 6 horas até a Fazenda de Cavalos de Lipica e as Cavernas Skocjan de Koper. O seu simpático guia local irá conduzi-lo pela pitoresca região de Lipica para vistas aéreas deslumbrantes e fantásticas atracções naturais. Você visitará o histórico Lipica Stud Farm, origem do cavalo Lipizzan, onde você pode visitar o Museu Lipikum e passar algum tempo com os cavalos. 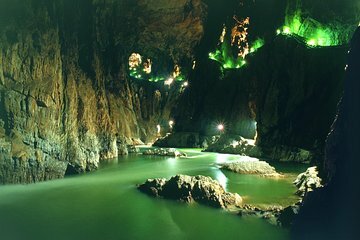 Em seguida, siga para as cavernas naturais Škocjan, um sistema de cavernas subterrâneas, listado pela UNESCO, repleto de estalactites gigantes, corredeiras e lagos. Passeie por um canyon subterrâneo e visite o Parque Regional Škocjan Caves ao ar livre no final do passeio. Good tour. Well worth our time and definitely happy that we booked it. The caves are wonderful be prepared for lots of walking up and down wet, slopping paths and stairs with occasional low ceilings. The stud farm was an easy walk around the grounds and through the stables. Our driver said that he spoke only a little English, but seemed to understand everything we said. I would have liked more information about the area during the drive, but that did not take away much from the tour. The arrival process was well-organized and finding our driver was easy. After the tour, we returned back to the pier promptly. Read the description of the tour very carefully. The Lipica Stud Farm entrance fee is NOT included in the price of this tour. It will cost 16 Euro additional. I didn't pay the entrance fee because I felt for what we got the Farm fee should have been included. Also when organizing your pick up time be sure to clarify the time. The local tour company said they would pick us up at 8am from the dock. We were there at 7:50am. The drive to the caves took 15 minutes but did not open until 10am. We sat at the entrance to the CAVE for one hour 45 minutes. Not even the gift shop was open. This was a complete waste of time. Now for the Caves, they are spectacular - nothing like I have ever seen. I would recommend seeing this UNESCO site it is breathtaking.